The Witness has gone. Or he has stayed and we have gone. Black Static 13 — Where The Heart Is — Null Immortalis — Black Static 19 — Crimewave 11 — BFS Journal Winter 2010 — The Horror Anthology of Horror Anthologies — Black Static 28 — This Hermetic Legislature — Black Static 34 — Rustblind and Silverbright — The Grimscribe’s Puppets — A Season In Carcosa — Horror Uncut: Tales of Social Insecurity and Economic Unease — Best British Short Stories 2012 — Murmurations. 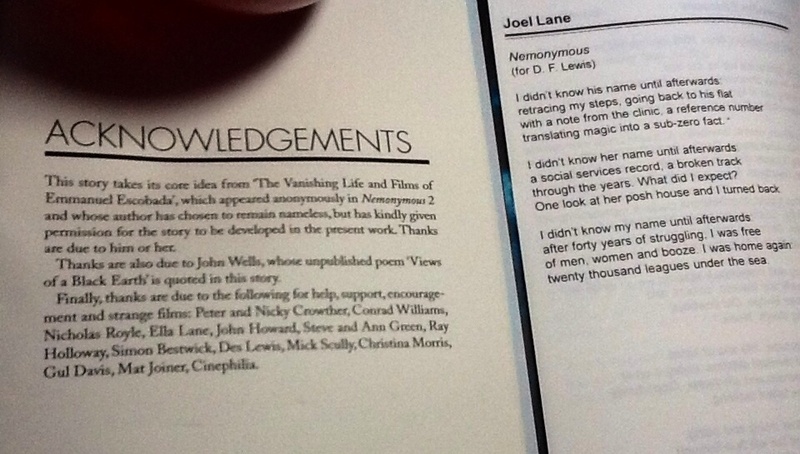 Joel Lane has a story in NEMONYMOUS TWO (2002) (and Joel later wrote a novella explicitly inspired by an anonymous story in that edition of the Nemonymous journal), and also stories in NULL IMMORTALIS (2010) and THE HORROR ANTHOLOGY OF HORROR ANTHOLOGIES (2011). His connection to Emmanuel Escobada HERE. 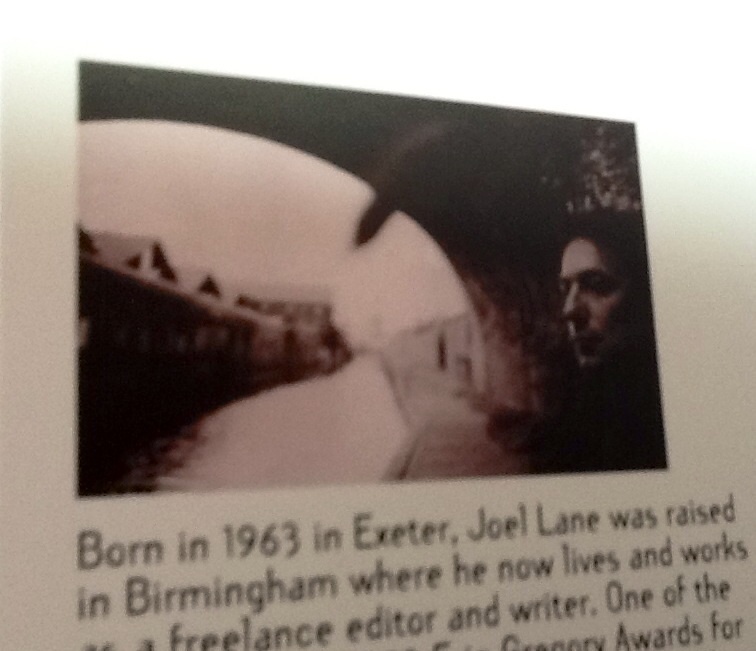 Will there be somebody like Joel Lane. 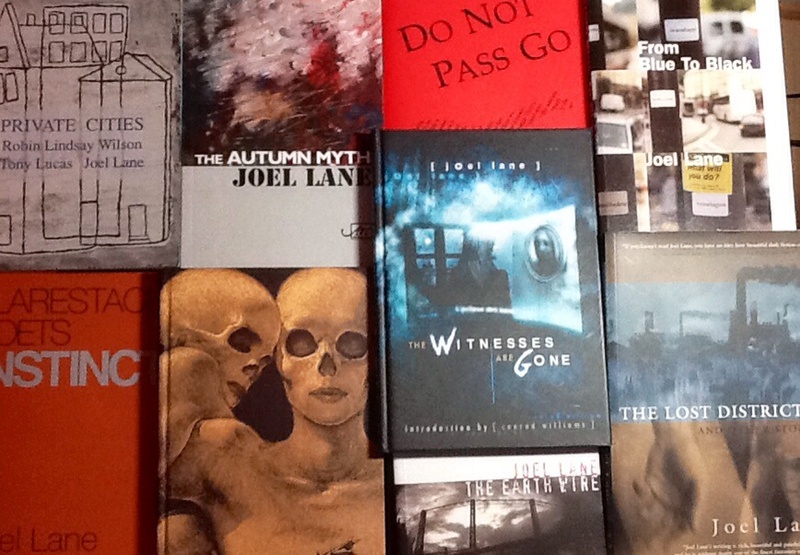 I also have many anthologies each with a single Joel Lane item. Joel and I didn’t always see eye to eye on, say, political theory (although I deem myself to be a working-class bred socialist) and on literary theory such as the Intentional Fallacy and on synchronicity… There are many feisty debates HERE over the years including an enormous number of wonderful posts by Joel himself. A dedicated Joel Lane thread on TLO HERE. And HERE is where Joel placed his own ‘Nemonymity’ poem in 2004. 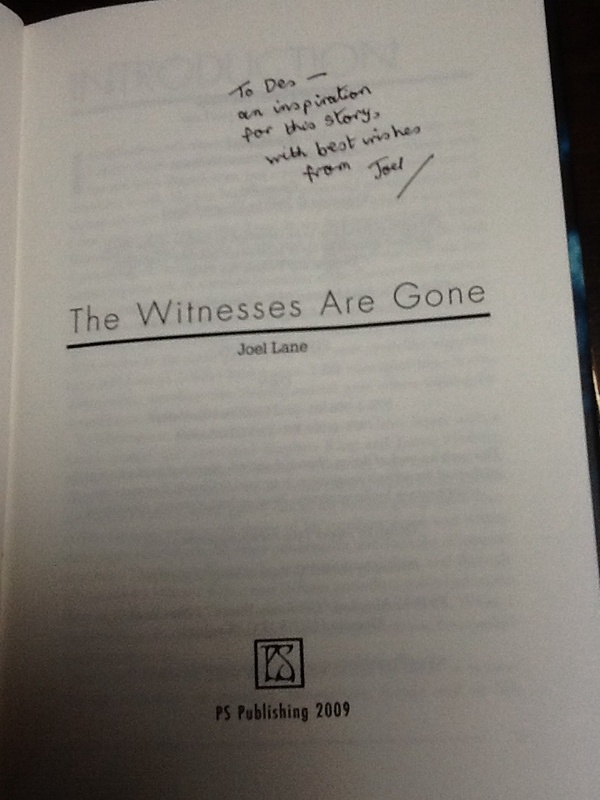 My story ‘Entries’ appeared in ‘The Last Balcony’ collection as a result of Joel’s encouragement to do so, eg: here. I last met Joel in July (2013) at a book launch in Peckham. He seemed on good form. I never retain my copies of BLACK STATIC – giving them away to deserving causes – but I do intend to re-read and re-review Joel’s SLEEP MASK story one day. [[ I was thinking of Leonard Cohen: “I told you when I came I was a stranger.” But the idea’s not that unusual. Nor is it really a paradox unless we accept the word ‘stranger’ at face value. What we get ‘close to’ in people is not the inner person but a kind of intermediate socially responsive layer. Which at the present time is becoming so thin you can not only see through it, but breathe through it. What’s inside is the unknown. We’re reverting to the pre-20th century social communication model that the telephone broke down. The internet is only written correspondence, though it’s quicker than letters (which have slowed down greatly since the late 19th century, when letters might be received within three hours of sending). Now people have close friends and even lovers whom they have never met, and we spend 90% of our supposed ‘social time’ alone. Just like the Victorians. In the days before mass communications and easy transport, many people had sexual relationships through letters. Now people do so online – quicker but very much the same. The phone is another modern idea that is now being phased out, like democracy, literacy and universal education. ‘We’re losing any sense of the primacy of offline life – not just in terms of how we experience culture (the book industry is in steep and terrible decline) but in terms of how we experience each other.’ That made me think about my isolation in New Zealand and then something wonderful happened today. A reader in America sent me a voice mail to try and cheer me up. I smiled and cried. So I don’t feel the original texts are perfect things. But Lovecraft didn’t work with a good line editor to polish his stories – he polished them himself, with variable results. The first-published versions are not superior. Edits inflicted on an author without their approval are no more valid than posthumous edits. In some cases, notably ‘The Shadow Out of Time’, the MS version is so far superior to the first-published version as to prompt a reassessment of the story. In other cases, the differences are minor and the restoration of archaic usages is faintly annoying. But the MS texts are the best available option in a difficult situation. [[ More self-publicity I’m afraid, but this one is my best shot – 13 years went into it. I’m very happy to tell you that my book ‘Where Furnaces Burn’ will be launched by PS Publishing at Fantasycon in late September. WFB collects together a series of 22 supernatural crime stories, all set in the West Midlands. It’s my attempt to blend the occult detective and urban noir traditions, revealing the myths and terrors buried within the industrial landscape. [[ Not so much a joke as a mildly amusing juxtaposition of Des and teenage skateboard culture. But maybe you really are a sk8r boi. [[ Stevie, you’ve identified a core aspect of the ‘Cthulhu Mythos’ that separates it from real religious traditions. The Mythos deities are actual creatures that happen to be worshipped by certain cults, but are aliens from other worlds. Our deities are a matter of pure faith: you can believe in them, but they’re only there if you believe in them and not otherwise. The Mythos deities are there whether you believe in them or not – Johannsen doesn’t have a religious ‘vision’, what he sees is like really there. All the religious paraphernalia of holy books and sacred rituals are valid in Lovecraft’s world, but not for religious reasons. I would describe his mythology as a kind of high church atheism. Yes, but as concepts, not as real creatures. In Lovecraft’s writing they are actually there. You don’t need faith to believe in them, they are physically there. That’s not religion at all. And no, atheism is not a form of faith, any more than it requires an effort of faith for me to believe that there no shoggoths in my back garden or night-gaunts outside my window. I don’t struggle to maintain the faith that they are not there. I don’t need some catechism to keep believing they aren’t there. I just don’t see any reason to think they are there. Religious faith requires a huge effort and investment of energy. Atheism doesn’t. When I look at the sky I don’t fight to convince myself and others that God isn’t looking back at me. I just see clouds or stars or both. Where is the effort of faith to convince myself that what I don’t see or hear isn’t actually there? Just how many mythical beings do I need to struggle to convince myself are not there when… they are not there? And how is the absence of such fantasies ‘blindly comforting’? [[ This is the second great crisis of global capitalism. The first, the Great Depression, gave us the rise of fascism (as the European ruling class pulled out the stops to prevent the people of Germany, Italy and Spain from building a socialist alternative), the Second World War, the atomic bomb, the Cold War and very nearly the end of it all. The current global depression will bring at least as much change and destruction, and it’s impossible to predict what will remain in a decade’s time. But we can’t expect little things like book publishing, or film-making, or us, to survive it all. Possibly Joel’s last public statement. SOMETHING REMAINS looks to be a remarkable book. I don’t understand how I managed not to know about it, but perhaps it was meant to be. I shall no doubt real-time review it.